The history of Christmas in the United Kingdom is steeped in pudding, though it’s not always been sweet. In the literal sense, the original Christmas dish, dating back almost 600 years ago, consisted of meats, grains, and vegetables. It wasn’t until the end of the 16thcentury, when “dried fruit was more plentiful in England,” that it became a confection. Yet, not even 50 years later, the English Parliament tested its staying power by reportedly banning it among other Christmas festivities. But, like Achebe said, traditions aren’t easily broken. And, 50 years later, it was back, by request of George I, who wanted pudding at his first English Christmas banquet. This sweet tradition has carried on through the centuries, providing key cultural motivation for confectionery brands. Look to experiential marketing tactics to remind consumers to enjoy the sweet things this holiday season and beyond. After all, science is in your corner. A Northwestern study reports 93% of “our actions can be predicted ahead of time.” And, it’s this stability that’s “necessary for our development and feelings of well-being.” In short, traditions allow us to feel safe. And, when they also make us happy, research shows the combination reduces risk of mental illness. But, it’s said we must continue these rituals beyond childhood. They must extend into the teenage years for best outcomes. This helps ensure our children, theirs, and beyond have positive upbringings and futures. So, what makes a great tradition? Traditions are made of things we come to rely on. For example, we use the same pudding recipe every Christmas at our grandparents’ house, until hands change. But, above all, traditions have a lot of sensory information. And, it’s these details that are “incredibly powerful psychologically” and have “a lot of significance.” For Americans, this may be the smell of Santa’s cookies baking (or for Brits mince pies) or their warm, sugary taste. It’s recalling these things and the safe, happy memories made with loved ones that keep traditions alive. The best experiential marketing tactics are like traditions in that they stimulate our senses. They also give us ways to make memories with loved ones – a reason most people prefer to buy experiences over material goods. This gives confectionery brands an edge, becoming a safe choice and even a mainstay in consumers’ lives. And, with Christmas fast approaching, the time to plan experiential tactics for confectionery marketing is now. U.K. confectionery brands have risen to this year’s challenges with success. Innovative offerings have driven the value of the market up 4.3%. The same is true in the U.S., where the CAGR is expected to be 3.1% moving forward through 2025. Keep the momentum and help people indulge in your confections this holiday season with these experiential tactics. Discover which may be best for your brand this Christmas to awaken their senses and make them happy. Confectionery and other food brands have an advantage since their products stimulate the sense of taste. That makes product sampling programs a no-brainer, especially since 80% of consumers are “most influenced” to buy after trying a product. And, this has shown to boost sales as much as 600%! The hard part is choosing the best place to activate. The historic decision has been to go in-store. In-store sampling programs offer tremendous benefits, such as giving easy means for consumers to buy on the spot. And, for event marketers and agencies, this equates to easy sales and ROI tracking. However, depending on planned experiential tactics, limitations may exist. These may be set forth by the retailer, such as location in the store, space available for use, and other key elements. You must plan for adequate inventory, while also facing the risk you don’t sell enough product due to low traffic. The good news is the cost of these activations is generally lower than other experiential marketing tactics. In-store sampling programs may seek to stimulate more senses, such as sight and hearing. This was the case for British chocolate brand, Thorntons. During one campaign, visitors to the stores were asked questions in an effort to reveal their perfect flavor of chocolate. They then took a seat at the “Taste Pod,” where they enjoyed their chocolate and an immersive A/V experience also influenced by their preferences. More brands, including those in the confectionery market, are choosing to take their experiential tactics to the streets with guerrilla marketing. Its draw for consumers is that its tactics usually come as a pleasant surprise. For event marketers and agencies, like in-store programs, guerrilla marketing tends to be lower cost, but usually affords more creativity in plans.The hard work comes in finding the best locations or events at which to activate and securing the right permits to be there. But, the brand awareness alone is usually worth the effort and often the primary goal. This is since measuring results is more difficult than with other tactics, though often possible with smart planning. For CPG brand CHUM Fruit Bites, creating awareness among college students in Southern California was the goal. This was not only of its healthy treat. It was to inform of its means for giving back, donating 15% of profits to Wildaid. To get the job done, it enlisted a brand ambassador, as well as someone to dress as a life-like gorilla. The latter turned heads and stopped traffic, allowing the other to share key messages and product samples. The Mentos brand of mints is known for guerrilla marketing tactics like this, and has activated street teams, PR stunts, and everything in between. One notable example was its “Who Says No to Mentos?” campaign, in which it set up photo booths in U.K. cities. Passersby enjoyed the animated gifs projected onto digital screens outdoors. They also enjoyed sharing them on social media, using custom hashtags that captured results. The other benefit for Mentos was the initiative’s reach well beyond its photo booths. Though pop-up shops vary in nature, they all share one thing in common: they’re temporary. But just because they are here one minute and gone the next does not mean that they are simple to design or execute. Often, their activation is intensive. Research is necessary to pinpoint the best location. Space must be secured, along with furniture and seasonal employees. Other considerations include merchandising, inventory, and promotions. Yet, if you’ve thought about a pop-up shop for your brand, the holiday season is the perfect time. A survey finds 61% of consumers visit a pop-up to find seasonal products.And, these temporary storefronts prove to be ideal for brands that want to make connections with consumers, especially those brands that may operate through other retailers or only have an online presence. So, they’re not new to confectionery brands, whose event marketers and agencies continue to step up efforts. Activating in new locations to capitalise on traffic has been a trend for 2018, with airports one of the hottest destinations. Haribo gummy candy brand got in on the action with its airport confectionery campaign. It appealed to the travelers’ childhoods by featuring a xylophone and the directions to play the Haribo jingle. This was in the middle of a bright display of the brand’s new travel-oriented, resealable pouches of candy. And, while pop-up shops like Haribo’s offer appeal in just being, the best way to maximize results is to get as creative as possible to drive a crowd. 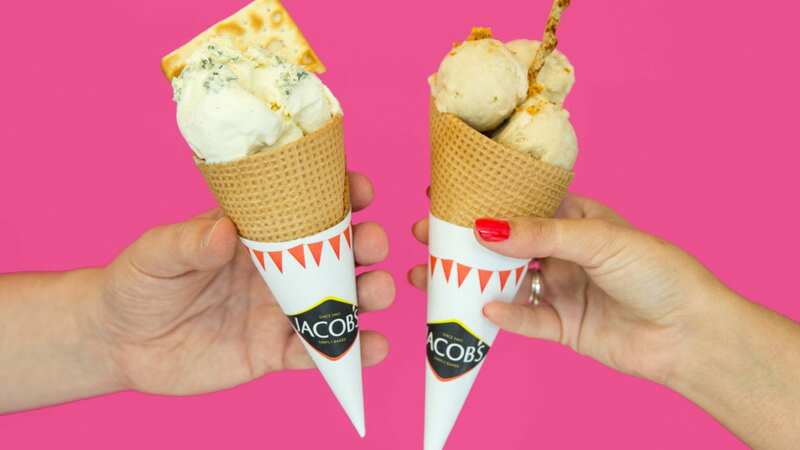 U.K. savory brand Jacob’s did that when it combined its products with sweets to activate the country’s first savory ice cream parlor. It was such a hit the line to try its innovative flavors wrapped around the corner, garnering much press coverage. But, the real success was the 3,500 consumers engaged. It was in stimulating their taste buds and other senses to bring happiness and fond memories sure to last.